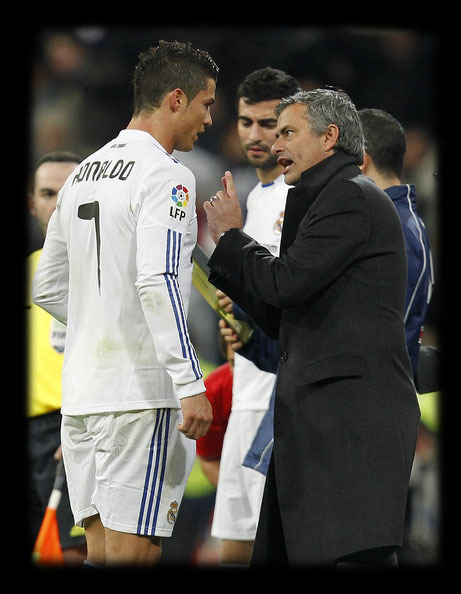 11.01.2011 »» Cristiano Ronaldo: "Mourinho teaches me everyday"
Cristiano Ronaldo said he learns something new every day while working with José Mourinho at Real Madrid. Real Madrid superstar Cristiano Ronaldo has heaped praise on José Mourinho, claiming he is indeed the best coach in the world. Mourinho won the Fifa Coach of the Year award on Monday evening and Ronaldo believes that it's nothing more than he deserves. "Those who are the most professional are those who succeed the most in life," the Portugal international told RealmadridTV. "It happens with both players and coaches, which is why I knew he would win. Any other result would have been unjust. "I don’t have a problem speaking my mind. He won three important titles. No one was more deserving. I am very happy for him. Mourinho and his staff are very professional. I was shocked when I began working with them because they only motivated me to work even harder." Cristiano Ronaldo added: "I always wanted to work with him; not only because he is the best, but also because he is Portuguese and his past success. That dream came true and now I hope he can win all that he won with Inter, Porto and Chelsea with Real Madrid. If the coach wins, we do too. For that reason we are going to work together." The praising continued and Ronaldo kept on the same note: "It isn’t a coincidence that he has won so many titles over the last five or six years. I have learned so much in the little time we have spent together. I learn something new every day. I feel more complete than ever and I want to continue learning because Mourinho is one of the reasons behind our success. I feel very comfortable working with him at Real Madrid."